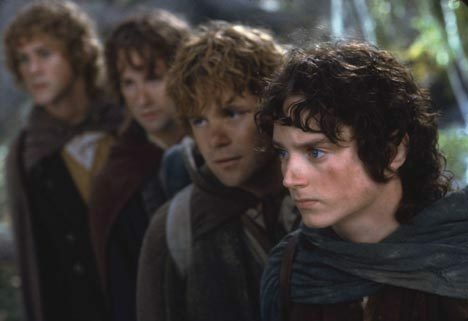 My friends and I are huge fans of Lord of the Rings, and we are totally psyched that they are in production on The Hobbit. I'm thinking of throwing a party when the movie premieres. This should give us, oh . . . 10 months to plan. If you were going to throw a Middle Earth party, what would you do? Before you plan this party, you need to figure out what level of fandom we're talking about here. How many of your friends have seen Lord of the Rings? How many of them have seen all the movies enough times to quote along with the characters? How many of them collect LOTR merchandise on eBay, edit Tolkien-related wikipedia entries, and are not embarassed to own elf ears? You need to choose the party that's right for them. If you're trying to cater to casual fans or win over newbies, you may want to pick your favorite film of the trilogy and have a little viewing party with fun snacks that appear in the films - more on that in a minute. If your friends love costume parties and would be comfortable geeking out over LOTR trivia, then you might want to step things up a bit. Buy a pair of elf ears and take pictures of each guest wearing them. Serve exclusively Middle Earth food, and play all 3 1/2 hours of the official soundtracks. Screen the movies silently in the background. Cover your bathroom in beefcake shots of Viggo Mortensen and Orlando Bloom. If your friends are not so much into dressing up, but they are die-hard fans, then an all-day movie marathon might be the way to go. Limit the party to people who can comfortably sit in your living room - we are talking about many many hours of viewing time! Provide Middle Earth snacks, and take a nice break between each movie for a main-course dish. At the end of the night, if anyone's still standing, consider playing Small World - one of my favorite fantasy strategy games - or even the Lord of the Rings Board Game. If you are interested in learning all about the imaginary food in the books, you are gonna love this article on wikipedia. But if you want to cut to the chase, some fine Lord of the Ringers over at this site have compiled a slew of actual recipes for food that's all the rage among hobbits these days. Personally, the recipes that jumped out at me are: Mrs. Maggot's Cottage Pie; Po-Tay-To Onion Soup; Elven Lembas Bread Recipe; Blackberry Tarts from Bree; and Ring Cookies & Sauron's Eyes (if I'm not mistaken, "chocolate shot" is Scottish for "chocolate sprinkles." Have fun with this! And let me know how your party turns out. Who knows? Maybe we'll turn you into a feature story.